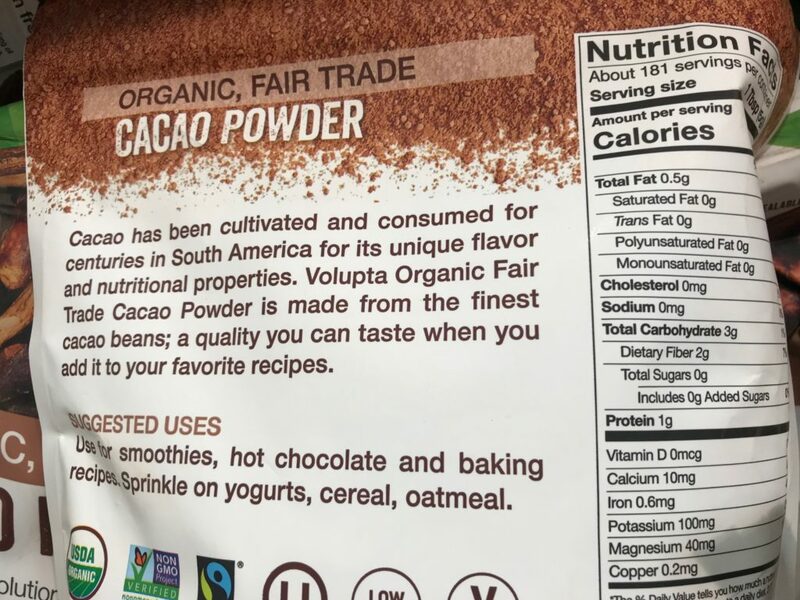 I recently found the Volupta Organic Cacao Powder at the baking section in my local Costco warehouse. 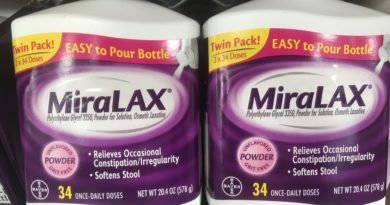 It is quite a popular product as while I was examining the package, four different people squeezed in and grabbed a bag for their cart. 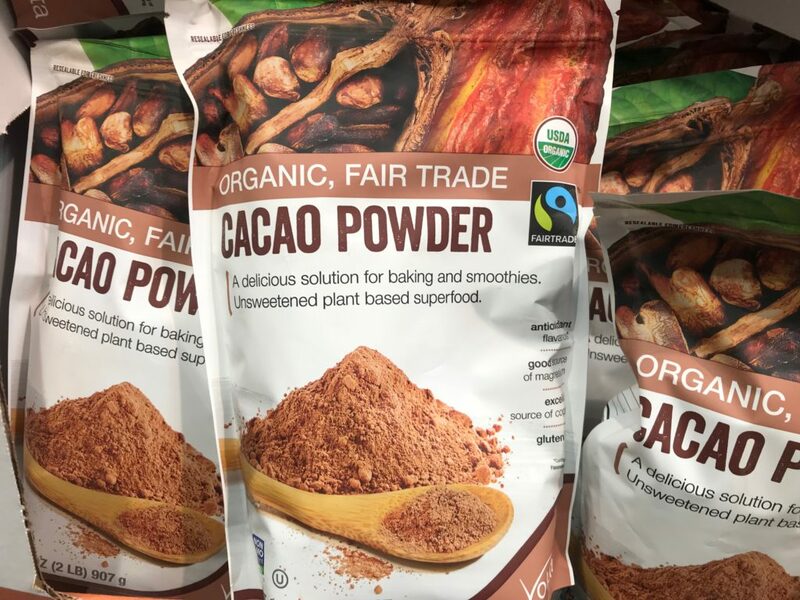 This cacao powder is USDA organic and certified fair trade. 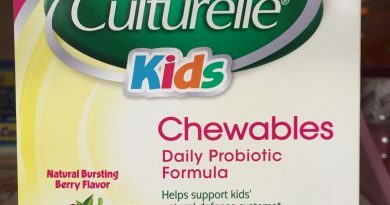 Moreover, the fine powder is naturally gluten free and vegan. That is beautiful news for people with lactose intolerance or generally just avoid dairy products. 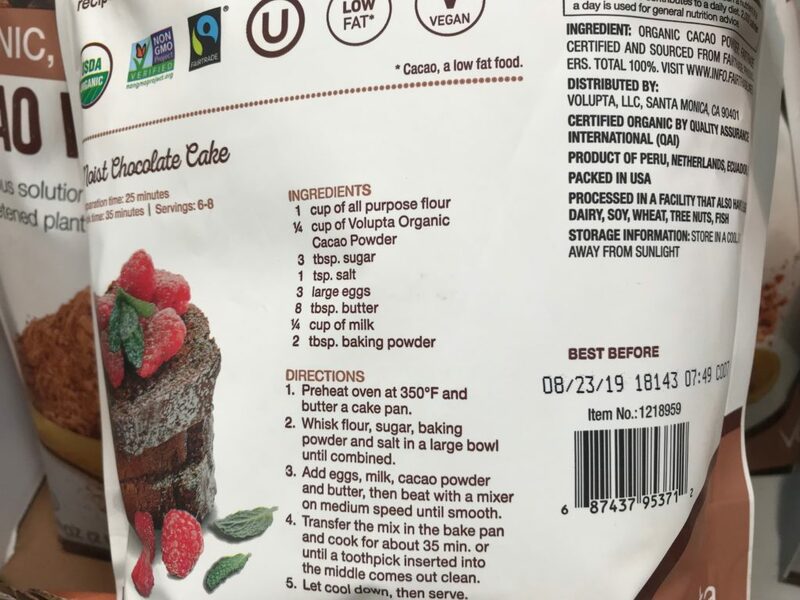 Cacao is a low fat food and this non-GMO cacao powder is unsweetened. Therefore, you can add a scoop into your vegetable smoothie or baking recipe guilt-free. For years, I have avoided most chocolate products as they invariably include some sort of milk or butter ingredient. With the cacao powder from Volupta, I can enjoy the sensational taste of raw chocolate while abiding by my dietary restrictions. It’s a win-win! Item name: Volupta Organic Cacao Powder. Packed in the USA. Product of Peru, Netherlands, and/or Ecuador. Organic cacao powder sourced from fairtrade producers. There are about 181 servings per container of Volupta cacao powder. 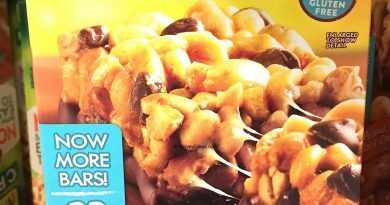 Each serving size is 1 tbsp or approximately 5 grams. Each serving only has 20 calories and 1 percent daily value fat. Additionally, there is 20% copper, 10% magnesium, and 1 gram of protein (daily value for adults) per serving. Surprisingly, I had never heard of the company before seeing this product. After some research, I learned that Volupta is a control brand company based in Santa Monica, California, that works with suppliers to bring high quality organic products. The cocoa in this product is sourced from Ecuador, the Netherlands, and Peru. Volupta acts as quality assurance and also packages the product in the US. The company also has a series of other great products in their lineup. I am dairy free as a person with lactose intolerance. This means usually I avoid all chocolate products as they contain some form of milk or butter. Living such a colorless life can be daunting but with a product like this from Volupta, you can welcome chocolate back to your life again. 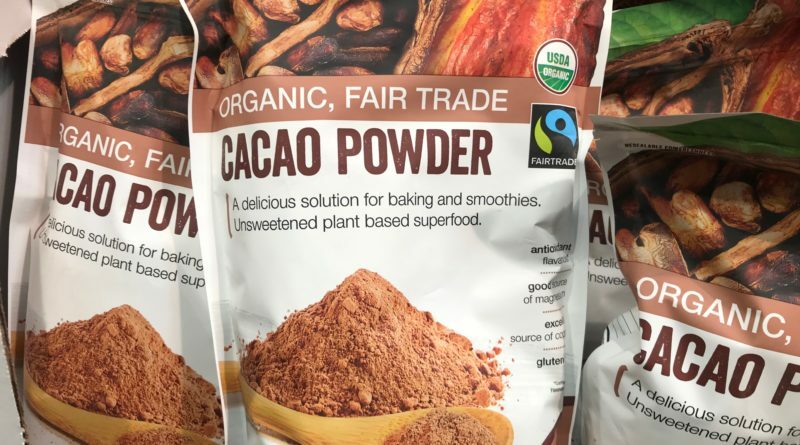 You can sprinkle this cacao powder on anything you enjoy, including yogurt and berries. With baking, this comes in handy if you are trying to create a vegan-friendly product. Add some flour, sugar, salt, and perhaps vegan butter, and you can create a dairy-free alternative to many popular desserts. Most Costco warehouses should have this product in stock. Based on my research, Amazon has this item in stock at the best price with shipping included. Are you dairy-free as well? How do you alter your recipes?